OUR APPROACH: Improve your technique – become a better player with our easy to use concepts! Practice at BeachTravels means a maximum of 6 players per group and court. All to make the coaches optimize the attention and feedback for every participant plus keeping the drills at the right intensity and quality. This camp is open for beginners to the elite, from indoor volleyball players to the experienced beachvolley baller and you can sign up individually or in a group with your friends. Everyone is welcome to join and you will train with others at your level and experience! – The way I have played some of the games this summer, I will have to go back to 2005 to find a better game. Because I’ve only played a handful of times after Portugal, it’s very obvious that I have BeachTravels to thank for this improvement. Even though I had high expectations I’m still absolutely stunned over the results. 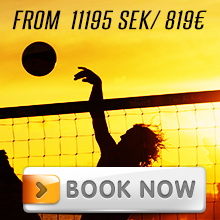 The more players you have at these camps, the better it will be for Swedish beach volleyball! During the training week you will work with the same coach, primarily to follow the same concept day by day for better feedback and learning. The basic offer includes practice every morning with your instructor except for the last day when you take part in the tournament BeachTravels Trophy.